Sunday, June 4, the full cabinet took the decision to go to war. 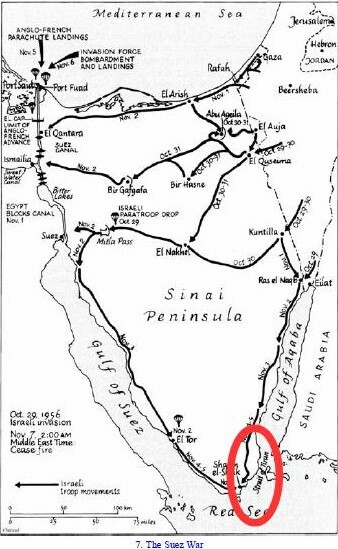 Israel destroyed the Egyptian air force on the ground in the early hours of June 5 1967. Syria for its part, wanted to stay out of this war. True, its air force made a sortie and its artillery bombarded Israeli settlements along the front line on 5 June, but these were limited hostilities and they ceased after Israel’s devastating counterattack on Syria’s air force. There was no need for Israel to open a second or third front. David Elazar, OC Northern Command, exerted all the pressure he could for all-out war against Syria, but Dayan kept him on a very tight leash. Dayan was determined not to run the risk of Soviet military intervention on the side of Syria. He was also worried that their forces would become overextended. “We started the war in order to destroy the Egyptian force and open the Straits of Tiran,” he said. “On the way we took the West Bank. I do not think that it is possible to open another campaign against Syria. If the idea is to go into Syria and change the border in order to make life easier for the settlements, I am against.” Dayan pointed out that the Syrians would never accept the loss of their territory, and the result would be never-ending conflict. Dayan pointed out that the Syrians would never accept the loss of their territory, and the result would be never-ending conflict. Rather than trying to move the international border, he proposed moving ten settlements to a distance of fifteen kilometers from the border. Dayan’s next move completely astounded his colleagues. Early in the morning on 9 June, a few hours after Syria requested a cease-fire, Dayan called General Elazar directly, bypassing the chief of staff, and ordered him to go to war with Syria. I believe that Israel is about to concentrate all its forces against Syria in order to destroy the Syrian army and regard for the common cause obliges me to advise you to agree to the ending of hostilities and to inform U Thant [the UN secretary-general] immediately, in order to preserve Syria’s great army. We have lost this battle. May God help us in future. Your brother, Gamal Abdel Nasser. 1. In my opinion this cable obliges us to capture the maximal military lines. 2. Yesterday I did not think that Egypt and Syria (the political leadership) would collapse in this way and give up the continuation of the campaign. But since this is the situation, it must be exploited to the full. Although Dayan got most of the glory for the victory over Syria, he himself later regarded the decision to go to war against Syria as a mistake. In his 1976 conversations with the journalist Rami Tal, Dayan confessed that on the fourth day of the June War he had failed in his duty as minister of defense by agreeing to the war with Syria. There was really no compelling reason to go to war with Syria, he said. Landau, Noa. 2019. “Trump Signs Order Recognizing Golan Heights as Israeli Territory.” Haaretz, March 26, 2019. https://www.haaretz.com/israel-news/.premium-trump-signs-order-recognizing-golan-heights-as-israeli-territory-1.7058996. Shlaim, Avi. 2014. 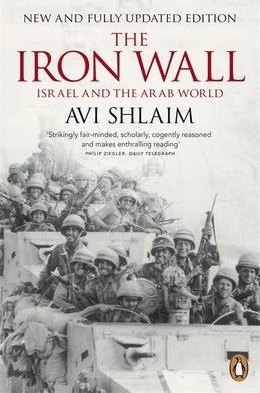 The Iron Wall: Israel and the Arab World. London: Penguin. Trump, Donald J. 2019. “Proclamation on Recognizing the Golan Heights as Part of the State of Israel.” The White House. Accessed March 27, 2019. https://www.whitehouse.gov/presidential-actions/proclamation-recognizing-golan-heights-part-state-israel/. Posted on 2019-03-27 08:20:27 GMT+0000 by Neil Godfrey. This entry was posted in Israel-Palestine and tagged Golan Heights, Six Day War. Bookmark the permalink. A small Syrian force attacks a water plant in northern Israel. Several Syrian tanks are lost in the early hours and the Syrian command abandon plans for a ground assault, opting instead to shell towns in the Hula valley. Israel turns its attention to , , , Syria’s air forces. By the evening . . . Syria has lost two-thirds of its aircraft. Israel later begins air strikes . . . and targets Syria air force bases. Syria . . . begin air strikes on Haifa. Syrian forces fortify the border with Israel and begin artillery fire. Fighting between Syria and Israel continues on the border of Golan. Fighting continues on the border of Golan. An attack on Golan Heights is ordered. After delaying its offensive against Syria until it can free up troops from the Egyptian and Jordanian fronts, Israel now moves against the Syrian army in its heavily entrenched positions in the Golan Heights. Paratroopers defeat a series of posts overlooking the Hula valley in the southern sector of the Heights, enabling the passage of tanks deep into Syrian territory. Israeli units move to trap the Syrians on the Golan plateau, but as the balance of power shifts in Israel’s favour, the Syrians flee. Early in the afternoon, Israel captures the town of Kuneitra and by the evening an armistice is agreed, leaving Israel in control of all of the Golan Heights, including parts of Mount Hermon. Cease-fire with Syria is agreed upon. • “Timeline: The Six Day War”. NPR. Lists of dates and events like this are a chronicle but not history. More meaningful are historical accounts that present contexts for the events, their scale, the decision makers, the evidence for certain motives and intents, etc. Chronologies are problematic, one might conclude that Syria invaded first per the above chronology, not knowing the prior water conflict. NB:The following report was released after Shlaim’s 2000 first edition. “THE JORDAN WATERS ISSUE” [PDF]. cia.gov. The water in Lake Tiberias . . . is becoming more saline, partly because of the current withdrawals, and one of the major problems the Israelis now face is to tap and divert the saline springs near the shore of the lake and at its bottoms. Thus far, they have had little success in capping the springs in the lake, but they have succeeded in diverting the springs on the shore. Chronicles, I think you mean, not chronologies. | A chronology of the major military events during the conflict. • I concur that chronicles is correct, but with the caveat that perhaps it may be deprecated in our Brave New World vocabulary of the masses. What’s interesting about this is what I also find and write a lot about on various other topics, which is, essentially, that there is no narrative. This has been one of my biggest realizations of history. When you really get down to it, so much of reality lacks narrative. And this is part of the issue, because people are so driven by narratives. People have a hard time comprehending history that doesn’t have narrative. They want history to be a story. But real history is often not a story and has no coherent narrative or driving purpose. I’m getting into this more in my next book as well. And its very unsatisfactory for many people. The reality that is revealed is that things happened in a kind of ponderous, unintentional, meandering way without foresight. And as a result of a bunch of random nonsense, these huge consequences emerge. Many people just can’t accept such things, much like the idea of evolution being random and not purpose driven. And I think many “historians” actually recognize this and they themselves, in order to be more appealing, create narrative where in fact no narrative exists. So yeah, I mean in so many ways, not just what you’re talking about here, the Israeli/Palestinian conflict is driven by false narratives and certainly many false beliefs. This is why I view history and issues like properly understanding Christian origins as important and not merely academic. Because many of the world’s problems today are driven by false narratives and beliefs about history that simply aren’t true. And those beliefs have real-world implications and millions of people have died and continue to die around the world as a result of beliefs in false narratives in many forms, relating to many different topics. Israel and Christianity just happen to be two of the biggest subjects around which false narratives have driven and continue to drive real-world conflict, but really its a pervasive issue that impacts virtually every topic in every culture. Avi Shlaim is a member of the “New Historians” who challenge zionist historiography, often on the basis of recently declassified state documents and new research into archival documents. See for example: “Avi Shlaim (2013): British partage of the 1948 Palestinian exodus “Al Nakba” YouTube. The question of narrative in history is a major one among historians with a long and diverse history of debates, discussions, philosophizing, disputes. It is interesting to compare our own personal lives or histories. An outsider will see so many diverse influences, interests, pressures, contexts, that have gone into our biographies, and when we look at our own past we are surely aware that there is much more to be told than what we can meaningfully relate when we reflect upon and talk about our past. Narrative is essential to give some shape and meaning to our past without assuming to be a complete story of our whole life — which would be impossible to present. It is like memory: we would become bottlenecked and unable to communicate anything at all if we remembered literally everything about a past event and attempted to communicate our experience that way. Selection for certain (narrative) purposes is absolutley necessary. That does not make the narrative invalid, however. Other narratives can also be told about the same event and the fact that they will differ from the one we give does not render them invalid either. Even the story of accidental bumbling into war with the interplay of the various actors and their respective interests is a narrative. It is necessary for the historian to be able to justify her narrative. That’s where the checks and balances enter. Perhaps I should have said that there is no narrative, but that the narrative isn’t a compelling one that serves any given agenda. Yes, arguably anything is a narrative, it’s just a matter of being a good narrative. Generally speaking, just random bumbling isn’t the way anyone would write a story or script, other than someone explicitly trying to make a point about the randomness of life. Interesting discussion about what Dayan really thought. And I appreciate R G Price’s comment that “real history is often not a story and has no coherent narrative or driving purpose”. But they are called the Golan Heights for a reason. They are not the Golan Plains. I visited them briefly in 1985. They have a commanding view over Israeli territory. For security reasons I would not want them in the hands of an enemy power. Your last sentence makes me think the best security for Israel would be that they remain with their legal (according to international law) owner and that Israel try to avoid doing anything that might make a generational enemy of their neighbour by stealing them. Stealing the lands is surely a guarantee for troublesome and very insecure relations for decades and more. After all, Israel has shown it can establish workable relations with other Arab neighbours (Saudi Arabia, Jordan, Egypt). 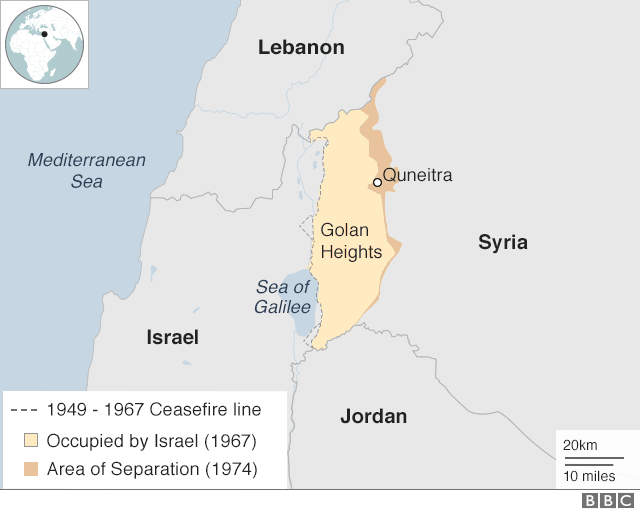 “Golan Heights profile”. BBC News. 25 March 2019. “Israel official reveals plan to change Golan Heights’ demographic balance”. Middle East Monitor. 28 March 2019. Meanwhile Putin has expelled 1/3 million Kurds from Afrin and donated it and Euphrates Shield to Turkey for re-settlement (many settlers were bused over to vote in the Turkish elections yesterday). That’s about 7 or 8 Golans. It is high comedy to pretend Damascus cares a whit about Golan. Do you know of any other state that cares not a whit about enemy capture and confiscation of its historical territory? Is Syria unique in the history of the world? Are Arabs not like other human beings? But the Golan Heights are in the hands of an enemy power. They have been held by Israel since 1967, and Israel uses them as a base for attacks on Syria. The Crimea is recognized as Russia by the real estate agent Bashar; it is in the hands of an enemy power and is used by Russia as a base for attacks on the Ukraine. The difference is that Ukraine hasn’t attacked Russia with genocidal purpose. (It is entering a fascist downward spiral like US, Russia and Israel, so they might imagine it.) These terminological disputes are absurd, especially where Trump imagines he can solve them by decree. The difference is that Ukraine hasn’t attacked Russia with genocidal purpose. Russia has attacked Ukraine with genocidal purpose? That is the logical inference from your statement. The Assad family could easily have recovered Golan in the seventies or eighties, and probably now, by the simple expedient of recognizing Israel and dropping its position that Israel is the equivalent of the Islamic “State” of Iraq and Syria. The Assads have internal political reasons for maintaining the 1948 state of war (the end of that state of war was the first thing explicitly conceded in the Egypt-Israel treaty) and refusing citizenship to descendants of Palestinians who took refuge there. ISIS-ization of Israel, dismal as it may be – was just more important to them than the Golan was. The same family – which seems to be a sort of real estate conglomerate – has accepted Putin’s sale of the Euphrates Shield area and Afrin to Turkey. The latter involved the expulsion of 1/3 million Kurds on racial grounds (1/2 the size of the disgusting Nakba expulsions) and recolonization with Turkish-approved settler populations (perversely Erdogan has been trying to move Palestinians there in particular – many of them see the identity and refuse – as he cuts down old Kurdish olive groves to make return pointless.) The area of Afrin+ES is five or six times that of Golan. The Assads just don’t care about this stuff, it’s strange you would be crying about it on their behalf. The context for this discussion – Trump’s nugatory ‘recognition’ of Israel’s imaginary annexation – is not worth a second thought. It will probably be reverted by the next president. Meanwhile of course Damascus has recognized Russia’s annexation of Crimea and recognized Abkhazia and South Ossetia. Are you so sure of that after reading the background to Israel’s capture of the Golan Heights in the above post? This is part of the Israeli narrative and the myth of the Golan Heights. You are very familiar with it, clearly. But have you ever stepped back and wondered what the actual policies of Syria have been and the rationales for them? Not from what the Israeli side of narrative says they are, but from the Syrian or Arab side of the debate? One way to get a clearer bird’s eye view of both narratives is to examine history books by authors such as Shlaim who have had access to documents not widely recognized in the standard Israeli narrative. Do you know why Syria and other Arab states have not recognized Israel till now, and why offers to recognize Israel by the Palestinians including Hamas! have been rejected by Israel? We need to be aware that the common narrative that is pushed to Westerners through mainstream and other media really is only one side of the story and we ought to be careful to examine it critically. The case is 100% symmetrical with the Sinai, which was clearly vastly more ‘important’. H Assad just preferred the state of hostility for internal political reasons, and for his status on the general Arab stage. That it was rather Israel that preferred this state of hostility, is again disproven by the Sinai. Syria and the other Arab states didn’t recognize Israel because they were engaged in a grand pan-Arab project at the time, and the expulsions and freak eruption of a ‘Jewish state’ was taken as a sort of national humiliation and impediment to unity. The claim that any of them ever had the least interest in the actual human beings expelled in the Nakba is unhistorical. I was reading the other day about a 4th generation Palestinian refugee from Bashar’s Syria who already has permanent residence in Ireland and will soon be a citizen and never had anything like this to look forward to. The founding of Israel was taken by the planet to be a minor Jew-Arab partition, a detail at the time of the partition of India and the giant movements of population in east Europe, coming a couple decades after the astounding events of the founding of the Turkish Republic and the division of population with Greece. All of these insane events were considered sensible by the slightly mad world order at the time. In all of them, the millions of refugees soon became citizens of definite states. The solution adopted by the world was for two states and everyone should still demand this and it should be forced upon Israel by an alliance of great powers. That Israel is a disgusting state, spiraling into some kind of neo-fascism – like most countries – is depressing, but again it’s a micro-state like Kuwait. No one labors details of the history of the Turkish Republic or declares it illegitimate because of the unimaginable horrors that it began with, nor because of the astounding crimes it commits nowadays – e.g. its half-Nakba of 1/3 million in Afrin and consequent jihadist resettlement. It’s a perfectly legitimate state that needs to change its behavior, like most of them, Israel certainly included. I don’t believe what you are calling the ‘standard Israeli narrative’ about anything and have read quite a bit of Shlaim. I’ve been a left wing crank and Israel critic since 1983. Do you have any intention of addressing the evidence cited in the post? H Assad just preferred the state of hostility for internal political reasons, and for his status on the general Arab stage. What were those “internal political reasons”, exactly? If Indonesia decided to confiscate northern Australia then I would expect any Australian PM to have very valid “internal political reasons” to protest, and even to have a valid case to present to the world stage of the United Nations. That it was rather Israel that preferred this state of hostility, is again disproven by the Sinai. How so, exactly? Please cite evidence to support any assertion. I was reading the other day about a 4th generation Palestinian refugee from Bashar’s Syria who already has permanent residence in Ireland and will soon be a citizen and never had anything like this to look forward to. So a transfer of all Palestinians to Ireland is a solution to the tensions? The planet? I don’t think you have read much about the history of the League of Nations’ or other Arab states’ role in this affair. I have posted a series on this blog about the early Zionist comparisons of a transfer of Palestinians with the Greek-Turkish problem and subsequently with the Indian partition. I am somewhat gobsmacked that anyone who is aware of these comparisons could relate them seriously to Palestine pre 1949. The solution adopted by the world was for two states and everyone should still demand this and it should be forced upon Israel by an alliance of great powers. Have you kept up to date with what’s been happening these past 20 years? How exactly would a two-state solution work today? I have never said “Israel is a disgusting state” and would sympathize with anyone protesting that such a characterization is bordering on anti-semitic. How about we be more precise with exactly what and who we think are the problematic parties. With nuclear weapons? When I last looked some years ago it was among the most powerful militaries of the world. Have you observed what the “labors” today are in relation to “the astounding crimes [a state] commits nowadays”? Are you trying to say that people don’t complain about today but use today to complain about something else that is presumably unrelated and that happened a long time ago? Is not his like a French resistance prisoner complaining about the German invasion of France and being told that his complaint is irrelevant to what he is supposed to be complaining about today? I don’t believe the “standard Israeli narrative” either (and nor do I believe I came up with the expression!) Left wing means nothing today as it used to mean. Today we might say there are two left-wings: the one that is quick to label any criticism of Israel as antisemitic and those who still continue to support justice for Palestinians. …on the State of Ohio’s side of the river. … remain to be fully understood.